Those are some nice bangs, 10-year-old Carrie. Not awkwardly short at all. This is a picture of me when I turned 10. 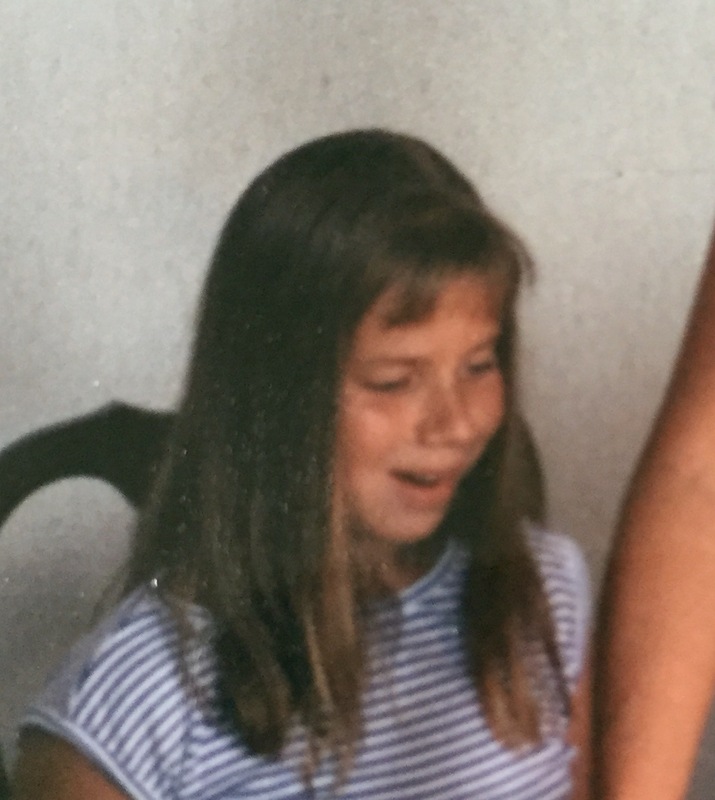 I’m looking down at my birthday cake, and my bangs are well shorter than society or style recommended, even for 1988. This was a running theme throughout my childhood. When my bangs got too long for my taste, I would sneak into my parents’ bathroom, find the scissors, and work my magic. This photo doesn’t show the worst example of my home haircuts, but it’s certainly representative. I can’t find the other school picture in which my bangs are approximately half an inch long after I “evened them out” the night before 3rd grade school pics. It may have been burned during a particularly ugly teenage moment. 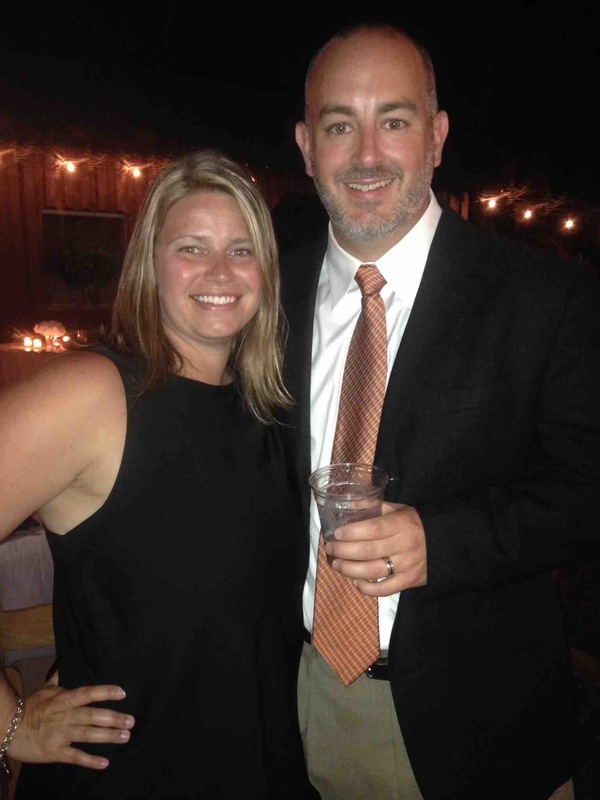 This handsome guy is my husband Jeff. In an economically savvy move, Jeff decided that he would no longer spend money getting his hair cut at a real place because, well, it’s only a quarter inch long and because we are cheap. He does just fine at cutting his own hair at home. I can’t say the same for his attempt at cutting our sons’ hair, which required an emergency Great Clips appearance the next day. We are no strangers to home haircut disasters, but the SAHM cheapskate in me has made this a hard lesson to learn. This is my dog Lexi, the only being on earth who loves me without judgment or reserve. 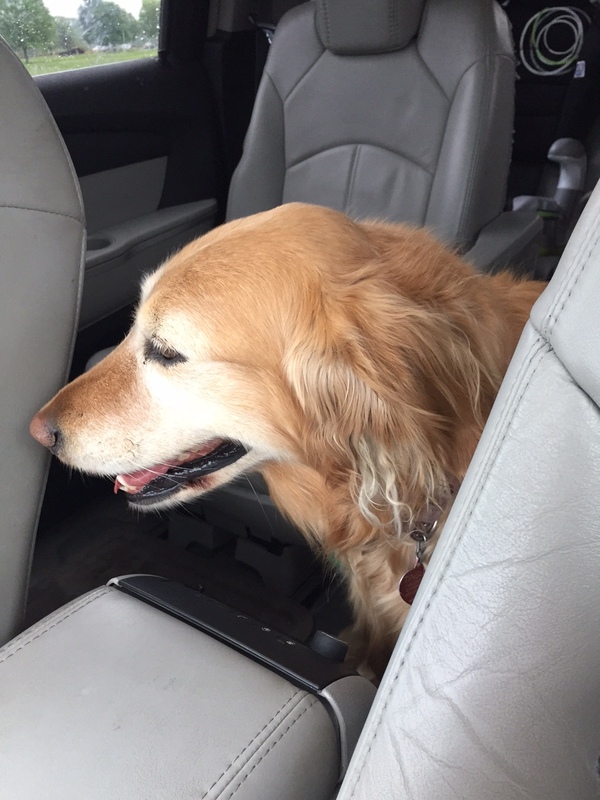 I am her person, and she is my dog, a golden retriever we rescued five years ago. If I were half the person Lexi thinks I am, I would probably be walking on water by now. I can even forgive her muddy paws on my hideous white kitchen floor because she’s such a sweetie. One Friday afternoon, she was smelling a bit ripe, so I decided to give her a bath in the front yard while the kids biked around our cul-de-sac. Then, the kids all wanted to help, of course. I cut her ear with the scissors. I cut her ear…with the scissors. I…cut my dog’s EAR…with.the.scissors. Frantic, I put Lexi in the car and left the children with a 10-year-old babysitter to fend for themselves. Long story short, this domestic disaster could’ve been avoided. I was too cheap to take her to a $35 groomer, and instead this accident put six stitches into Lexi’s ear and cost me $250 at the vet. Jeff was thrilled, as you can imagine. I am happy to report that Lexi has only had about two baths since then, neither of which included grooming her ears. This is our cat Georgia, our oldest child whom we adopted as a junior-sized kitten in 2004. 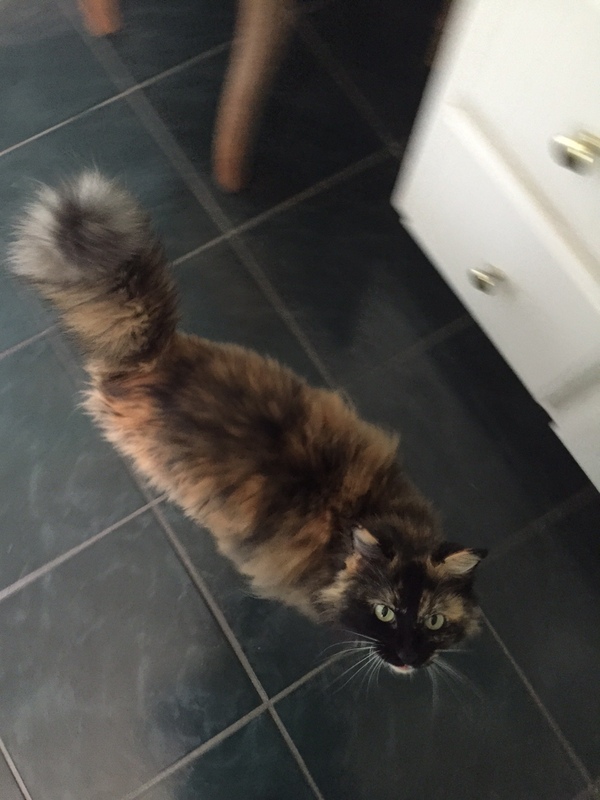 A fluffy, long-haired calico, Georgia sheds her winter coat all over the house each spring, constantly grooming herself and occasionally throwing it up on our floors. Several years ago, she was sprayed by a skunk, and our vet recommended shaving her coat to help alleviate the God-awful smell. We did. And then we got the bright idea to shave her every spring to avoid 97,000 tufts of cat fur and barf all over our house. It was genius. 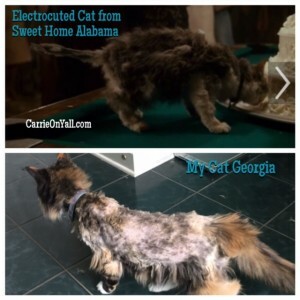 Our vet Jason in Tennessee is also a good friend, and he confided that Georgia is one of the roughly 25% of cats who need to be, um, sedated in order for all parties to have a pleasant grooming experience. Kind of expensive, but worth saving my sanity. 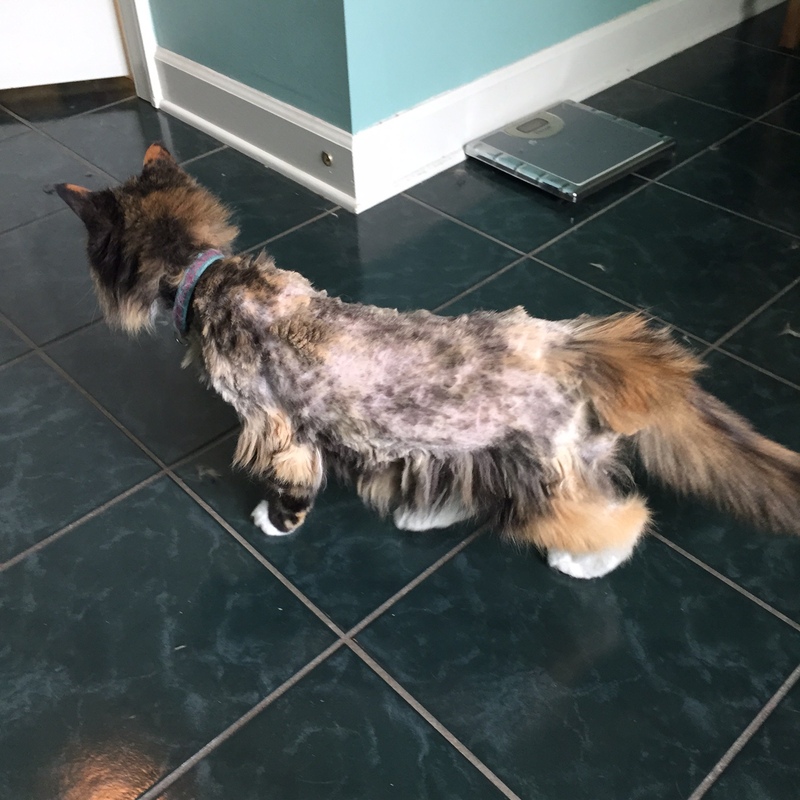 We gratefully accepted Jason’s friend discount, slipped her a mickey, and Georgia came home skinny, svelte, and groomed into her lion’s cut, ready to take on back yard birds and moles. 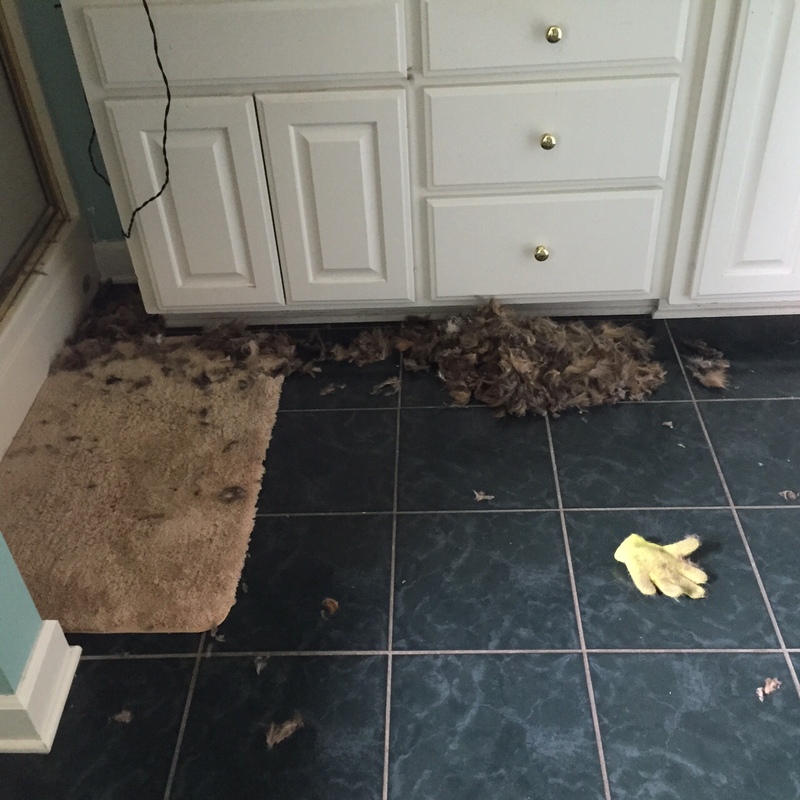 But now we’ve moved to Arkansas, the land of full-priced veterinarians, and there are tell-tale tufts of fur popping up all over the house. 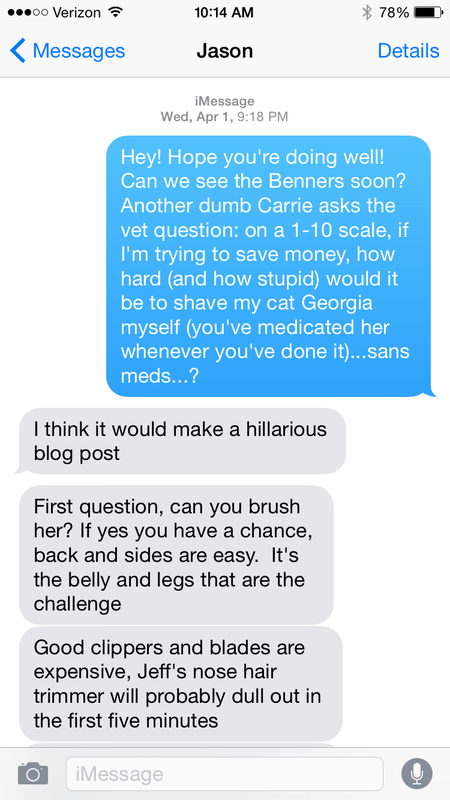 So, having learned nothing at all from previous home grooming disasters of myself, my children, and our dog, I sent this text to my vet friend Jason. I have totally got this, I thought. My cat loves me. This can be over in no time and I will have saved our family, like, $125. Totally worth it. Surely it can’t be that hard, right? My inner monologue was so, so, SO wrong. And Georgia never scratched me, bless her precious, kind, still-loves-mom-even-though-she-did-this-to-me heart. Ugh. I’m the worst mother ever. I’m probably going to start a GoFundMe account to fix Georgia’s jacked up fur because Jeff is in “I told you so” mode. And yes, y’all. I’ve learned my lesson. Be they for child or pet, NO MORE HOME HAIRCUTS. You are so funny, Carrie. I had bangs like that, too.My granny made me place a piece of cardboard over my face and she snipped away! Carrie, I have not laughed this hard in months. Thanks and I apologize to your boys for thinking it was their fault. Imagine me having lunch at the Blue Chair in Sewanee after attending an art workshop… Just sitting there, by myself mind you, having a quick sandwich and reading your blog. Ok… Now picture me getting so tickled I am snickering out loud and eventually blowing iced tea out my nose by accident. Had to cut my lunch a little short. I get self-conscious when people stare. My bad memories of too short bangs as a child was when my mom took me to the salon and the woman gave me the too short bangs and then said they look “cute”. That is a code word for dorky looking, I have come to understand. I always wanted my hair long, but my mom made me keep it short. My ex liked it short, so I really never grew my hair out. I have been growing mine out thanks to home haircuts by my boyfriend, regular micro trims and my hair is now long. I took on the barbering role for a short time because of bad haircuts for the kids at the barber. I think I did pretty well, never cut an ear and haircuts looked good. My boyfriend kept me from screwing up. I have urges to cut my hair sometimes, but being he cuts mine for me he would notice and he would be the one who would have to fix it, so I don’t. I just found you, yes I’m a little late to the party pass me a drink… I am snort laughing at your cat, she must have been so embarrassed to not even show her face in the picture.